MILFORD, Conn. – Thinklogical LLC, a global manufacturer of secure fiber optic video and KVM routing and extension systems, today announced that retired Gen. Norton A. Schwartz, former U.S. Air Force Chief of Staff, will be the guest speaker at the Thinklogical Technology Summit, April 18, 2013 at the Sheraton Premier Hotel in Tysons Corner, Va., and May 22 at the Sheraton Cerritos Hotel in Cerritos, Calif. In a presentation titled “Remote Military Aviation Systems: Myths and Reality,” Schwartz will address the role of remotely-operated aviation systems (called drones by many) in the U.S. defense arsenal, their consequences and implications for defense policy, the American image of war, and the country’s physical security in an age of stateless terrorism. Schwartz graduated from the U.S. Air Force Academy in 1973. As Chief of Staff, Schwartz served as the senior uniformed Air Force officer responsible for the organization, training and equipping of 680,000 active-duty, Guard, Reserve and civilian forces serving in the United States and overseas. 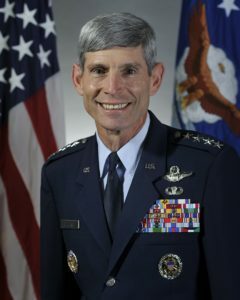 As a member of the Joint Chiefs of Staff, Schwartz and the other service chiefs functioned as military advisers to the Secretary of Defense, National Security Council and the President. The Thinklogical Technology Summit are complimentary, day-long events that feature audio-visual product demonstrations, training, and market insights from Thinklogical and its partners. Audio-visual design consultants, system integrators and Thinklogical users interested in attending can contact Thinklogical at [email protected] or call 800-291-3211 for more information. Thinklogical’s fiber optic-based audio, video and peripheral routing systems are used in secure command and control centers (C4ISR) and enable multi-domain isolation and control of key computing resources and their associated networks, while empowering rich collaboration capabilities across authorized functional groups and organizations. Thinklogical is the leading manufacturer and provider of fiber optic KVM, video, audio, and peripheral extension and routing solutions. Thinklogical offers the only fiber optic KVM routers in the world that are accredited to The Common Criteria, EAL4 and TEMPEST. Government, entertainment, scientific and industrial customers worldwide rely on Thinklogical’s products and solutions for security, high performance, continuous operation and ease of integration. Thinklogical products are designed and manufactured in the USA. Thinklogical is headquartered in Milford, Connecticut and is privately held by Riverside Partners, LLC, Boston, MA (http://www.riversidepartners.com). For more information about Thinklogical products and services, please visit thinklogical.com. Follow Thinklogical on LinkedIn at http://www.linkedin.com/company/thinklogical.